I was at client meeting the other day with some fellow coaches and as we were being briefed on the company they shared that they were trying to build more of a feedback culture – as one of the lowest ranking items on their engagement survey was about receiving feedback. I have been known to say that performance management is the bane of all HR professionals existence – we have been fixing, updating, changing our performance management systems forever. Same goes with feedback… why can’t we seem to make this happen or embed this into our cultures??? I don’t know about you but when someone says to me “I have some feedback for you” I kind of cringe a little bit inside but than take a deep breath and say to myself … all feedback is a gift. But is it really? Unfortunately feedback has become synonymous with “let me tell you what you have been doing wrong.” So, no wonder most people aren’t raising their hands willingly to get it, and most managers don’t look forward to giving it. Ok you may be thinking… now tell me something I don’t already know! I am not sure I can deliver on that but what I will say is … when I have received “feedback” from my managers, peers, staff, and significant others who have a sincere desire to help me to be better – it has been both powerful and life changing. Marshall Goldsmith, a highly respected leadership coach and management guru, has reframed this concept as feedforward. 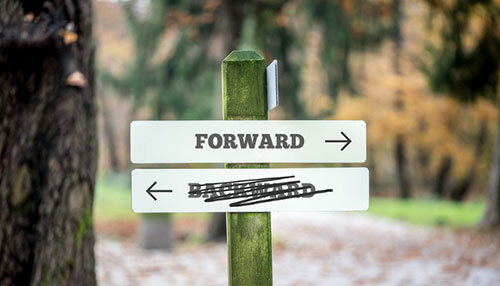 Feedforward focuses on helping people focus on the future vs. the past. The basic premise is — you can’t change the past but you can change or create the future or at the very least, try your best to do so. By asking people for suggestions on things you can do to be more effective in an area that you would like to get better at (cause most of us already know what we need to work on) – is not only easier for you to hear but is easier for others to provide you. While the suggestions you receive are personal … they don’t feel personal … meaning that they aren’t intended to remind you of what you may have done wrong yesterday, last week or last month but are intended to provide you with specific suggestions on what you can do to change your behavior or impact today, tomorrow or next week. So here is a feedforward suggestion – why not give this a try and let me know how it goes!